The Missouri Department of Transportation’s gearing up for winter with the hiring of seasonal workers. The agency plans to bring in up to 700 new employees who’ll assist with storm response and other operations performed in cold weather months. Allmeroth says predictions change on short notice in the state because the Rocky Mountains often throw storms off of their path, while the Missouri and Mississippi rivers can change their trajectory as well. A typical winter brings 20 inches of snow. Allmeroth says last year was unusually mild, which is somewhat concerning if drivers forget how to navigate the elements this season. Missouri is also an innovator in that it’s the leader in the country with 82 “tow plows”. This machinery is towed behind the plow truck itself and allows for plowing of two to three lanes of traffic at one time. Allmeroth says several accidents have resulted from drivers not noticing the tow plows and trying to pass the trucks, not realizing the equipment is occupying the lane they’re in. MODOT is now in the process of hiring seasonal employees and plans to have the personnel in place by the end of September. Those hired for the winter typically work through the end of February. Seasonal employees are paid $12.69 per hour while working a standard 40-hour week. Emergency snow plow operators earn between $14.10 and $15.94 per hour, but don’t have guaranteed working hours. 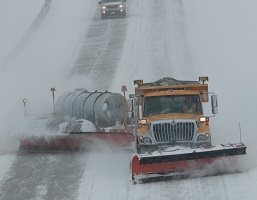 To learn more about MoDOT’s winter operations, log onto modot.org or call 1-888-ASK-MODOT (888-275-6636).